A flag is a symbol of excellence and pride for an armed uniformed organisation like the Royal Malaysian Police. The flag of the Royal Malaysian Police is called Sang Saka Biru [I cannot translate this term]. The colour blue is chosen as it is the common colour among most of the police forces around the world. Blue represents peace, well-being and stability that is the main aim of a police force. The logo of Royal Malaysian Police that is use today has its own significance and meaning. The Crescent and Star symbolises Islam as the official religion of the nation. The calligraphic rendition of the name of Allah represents the element of piety as the symbol of sovereignty of Islam. The Crown represents the devotion to the holiness and omnipotence of Allah; it also represents our loyalty and honour of HM the Yang Dipertuan Agong who invested the 'Royal' title to the Police Force. The Keris (dagger on the left hand side) represents Peninsular Malaysia. The Parang Elang or Kelewang [dagger on the right hand side, literally means Eagle Sword] represents the states of Sabah and Sarawak. The Tiger represents bravery and agility in facing challenges from the enemy. The Rice Stalks represent the staple food of the nation and symbolises the prosperity of the nation. The motto 'POLIS DIRAJA MALAYSIA' (Royal Malaysian Police) represents the spirit and tenacity of the officers of the Royal Malaysian Police. Flottes de Combat 2002, French equivalent to Jane's Fighting Ships [jfs], presents a photo of Malaysian Police vessel PZ9. She flies a national flag as ensign. image by Herman Felani M.Y. The colour is approximately 3:4, as is the norm for many parade flags. See the colour on parade at http://www.rmp.gov.my/rmp03/Alb.Perbarisan%20Diraja%2017Nov2006/44.jpg. The Colours of the Royal Malaysian Police was invested by HM the 3rd Yang Dipertuan Agong, Tuanku Syed Putra Almarhum Syed Hassan Jamalullail on the 11th November 1992 [should be a typo as HM reigned from 1st September 1960 through 20th September 1965]. The Investiture of the Colours constitutes an acknowledgement and recognition of the glorious success and sacrifice of the Royal Malaysian Police during the Communist Rebellion in the First Emergency [1948-1960]. During this Emergency the police killed a total of 5,762 Communist Terrorists. The Royal Malaysian Police suffered a total of 1,346 officers killed and 1,601 officers injured in this effort to defend the nation's sovereignty. The Investiture also serves as an inspiration to Royal Malaysian Police officers of today to serve the force and the nation with dedication and excellence. I came across the following sites which have additional information on the Colours of the Royal Malaysia Police that might be of interest. I'm unable to read the inscriptions on each Colour. The pipe banner of the Royal Malaysian Police as seen on http://www.rmp.gov.my/rmp03/album/Sekitar%20Malam%20Mess%20sempena%20persaraan%20pegawai%20kanan%20polis/mess2.jpg. The photograph is with regards to a police mess dinner. The banner has a plain blue field and is charged with the police emblem at the centre. The base of the banner from what I can tell, seems to be split into two rounded edges (double-tailed descate), and the banner is fringed in white. In 1963, as is known, the Federation of Malaya added three new states, Sabah, Sarawak and Singapore to become the new Federation of Malaysia. The existing Police forces of these entities were merged into one new Polis DiRaja Malaysia (Royal Malaysia Police). The Police Flag of 1963 � 1965 featured the Police Emblem of 1963 � 1965, which was similar to today�s but featured a lion head instead of a tiger�s head. The lion head represents the Singapore component just as the Malay dagger (the keris) represents Peninsular Malaya and the north Borneo machete (the Parang Elang or Kelewang) represents Sabah and Sarawak. The lion head was replaced with the present tiger head upon Singapore�s secession in 1965. Part of the information about this badge was from Peer M. Akbur's book "Policing Singapore in the 19th and 20th Centuries", (Singapore : Singapore Police Force, 2002), p.136, specifically "... The lion's head in the crest depicted the Singapore component. When Singapore separated from Malaysia, the lion's head was replaced with a tiger's head." The image of the badge was from "Majallah Perkawalan", (Singapore: Jawatankuasa Perhubongan Pasokan Bersenjata), October 1963 issue (English: Security Magazine). However, unlike Akbur's description, the editorial text accompanying the badge image in this magazine mentioned that it was a tiger's head. It described the badge in Malay as follows, "Dalam majlis itulah diadakan upachara menaikan Bendera Polis Di-Raja Malaysia yang berwarna biru, bertanda keris bersilang dengan gambar kepala harimau di-tengah2nya itu,...", which translates into English as, "the ceremony included a flag-raising ceremony for the Royal Malaysia Police flag which is blue, with a crossed keris and the depiction of a tiger's head at the centre, ..."
Yet in another service magazine, the description of the badge read, "... the kris represents the State of Malaya, the parang hilang the State of Sarawak, and the lion's head the States of Singapore and Sabah,...", "Malayan Police Magazine", Volume 3, September 1963, (Kuala Lumpur: Royal Malayan Police), p.114. Thus there seem to be multiple descriptions of the badge adopted in 1963 on the merger of the various police services of Malaya, Singapore, Sarawak, and Sabah. Nonetheless, it is quite apparent that the animal at the centre resembles a lion more than a tiger. Akbur's entry mentioned of the replacement of the lion's head with a tiger's head upon Singapore's secession from the federation. However, from the personal website dedicated to the police organisation (http://www.geocities.com/abang_didi/bendera.html), the flag with the service emblem featuring the lion's head was noted to be in use until 14th March 1991. The Malayan Police Magazine and later Royal Malaysia Police Magazines continued using the emblem of 1963 on their covers after 1965. Thus my note on the badge being used from 1963 to 1965 is incorrect for Malaysia, but more appropriate for Singapore. An image of the Royal Malaysia Police service flag of 1963 to 1991. The Federation of Malaya Police received their royal status and was thus renamed to Malay as the "Polis Di-Raja Persekutuan Tanah Melayu", in English the Royal Federation of Malaya Police. 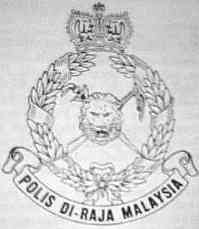 The police emblem was updated with the Malaysian crown, and the text on the scroll was changed to reflect the new title of the force in Malay (Polis Di-Raja Persekutuan). The new emblem was charged on a plain blue field to make the service flag. The Royal Federation of Malaya Police colour was presented in 1961. The then-police emblem and battle honour's scroll was depicted in gold charged on a blue field, the flag bordered in gold and was completed with gold fringes and tassels. The Federation of Malaya Police Flag used from 1958 to 1959 as noted on http://www.geocities.com/abang_didi/bendera.html and as can be seen on several photographs in the Malayan Police Magazines of that period, had a plain blue field with the emblem of the Malayan police of that period at the centre. The emblem then had two keris in saltire within a garland of paddy sheaves. The scroll held the inscription "Fed. of Malaya Police". From an article on the official website of the Royal Malaysia Police, an anti-piracy demonstration held on 7th July 2004 by the Royal Malaysian Police's Marine Unit shows police vessels flying the blue Malaysian government ensign. The main site with the report (in Malay) with photographs is at http://www.rmp.gov.my/rmp03/album/Demonstrasi%20serangan,%20menyelamat%20maritim/040702_imb.htm. A photograph in Malayan Police Magazine, June 1955, p.74 shows a police vessel (PC18) flying the federation flag of 1950 at the stern of the launch, a parallel situation to Armand's note of 14th February 2001.